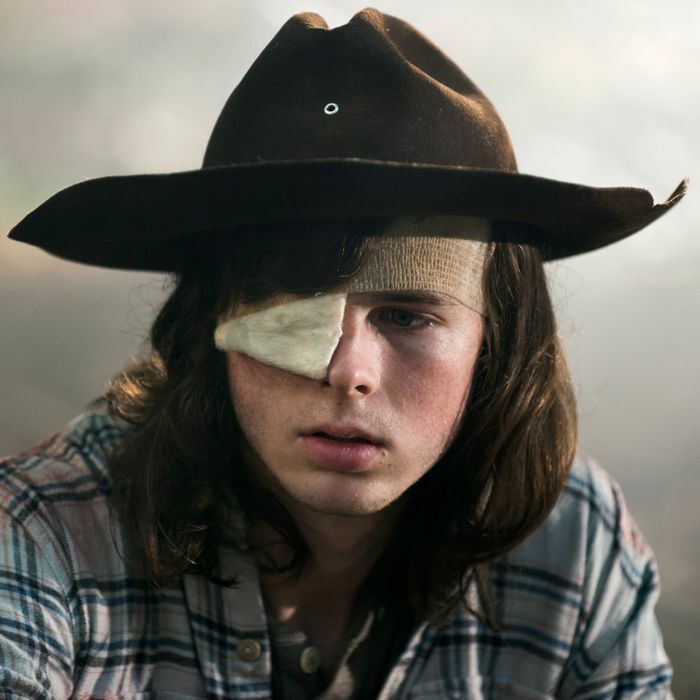 Sunday night was a rough one for fans of The Walking Dead’s Carl Grimes, the shaggy-haired, one-eyed, Stetson-wearing, pudding-loving son of Rick. The show’s midseason finale already made it clear that Carl’s time among the living was short, after he’d left Alexandria to find Siddiq, the mysterious loner whom Rick had chased off. Siddiq’s deceased mom believed that killing zombies freed their souls, but unfortunately for Carl, his act of mercy in helping Siddiq take out a few undead was his death sentence — he ended up with a walker on top of him and a nasty bite on his flank. Instead of getting all emo or flying into a rage, Carl takes the news with a strange sense of serenity in Sunday night’s midseason premiere, “Honor.” He spends time on the porch with his little sister, Judith, and takes a selfie; he writes good-bye notes to Rick, Michonne, and Enid; he soaks up the sun one last time; and then he grabs a cot, some candles, and prepares to die. Down in the sewers where the Alexandria survivors fled the Saviors’ onslaught, Carl show Rick and Michonne those teeth marks, and a slow, agonizing good-bye ensues. He tells Judith that their mom once said Carl would beat this crazy world — bad prediction there, Lori, but Carl says he’s sure his sister will do better than he did. He tells Michonne she was his best friend, and implores her not to carry this sadness with her. But Carl saves his most important parting words for his pop. As Rick has become consumed with survival at any cost and revenge against Negan, Carl has been the yin to his yang, a reminder to keep a tight grip on his humanity. With some of his last words, Carl explains that Rick’s decision to show mercy on the Woodbury survivors back at the prison made him the compassionate teen he’d become. As Alexandria burns, Rick and Michonne carry Carl to what’s left of Gabriel’s church for his final moments. “You can still be who you were,” Carl tells his dad. “It was all for you,” Rick says. “Right from the start. Back in Atlanta. The farm. Everything I did, it was for you … it still is. It’s gonna be.” Rick says he’s sorry for not protecting his son, as a father should. Carl says that Rick’s only job was to love him. Holy waterworks, Batman. So, how does Carl actually die? In one last act of compassion, he insists on writing the end to his own story, rather than let his dad put him down. As Rick and Michonne wait outside the church at daybreak, a single gunshot rings out. Rest in peace, Coral.